Zoe, aka Z-Queen, Zo-Zo, Z-Girl, ZoeGirl, Beauty Queen, and Mrs. Velvet Ears; was part black & tan with a touch of Doberman who had the sweetest hound face. When she first came to live with us in January 2001, her name was Rory. She came by way of my friend Shana who had adopted Rory from the Wake Co. SPCA. Rory had separation anxiety and pretty much destroyed Shana’s bathroom and was on her way back to the pound. I was working from home at the time and wanted to get another dog, so Rory came to live with us. Only thing was, I had trouble saying the name “Rory”; although someone told me that’s exactly how the dog would pronounce her name if I asked her. I wanted something short and ending in an “Eee” sound and Zoe came to me pretty quick. 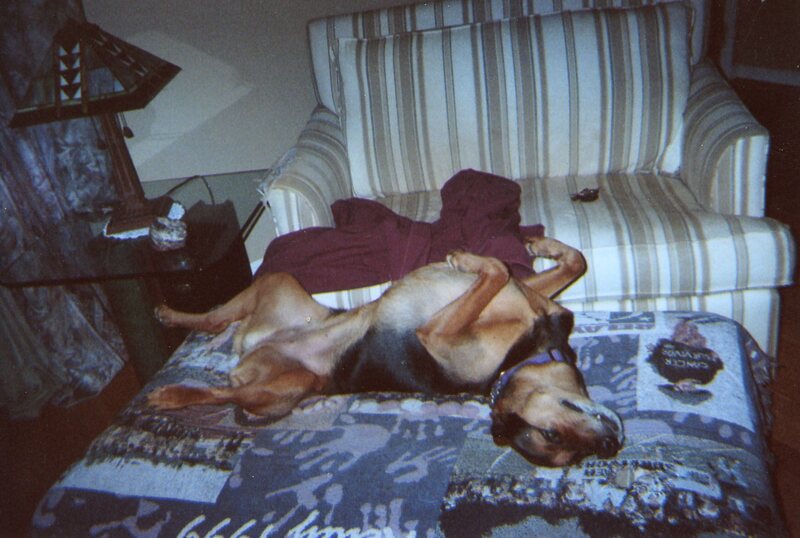 ZoeGirl was such a lady. She seemed to like it, and I have never seen a dog happier than Zo-Zo to start a new day. We would get out of bed with the dogs leading the way to the kitchen and Zoe would literally gambol down the hall nipping at Dudley’s ears. Dudley rushed because he knew breakfast was in the kitchen, but he also wasn’t wild about this Mike Tyson wannabe nipping at his ears first thing in the morning. It didn’t matter to Zoe, she nipped at Dudley’s ears almost every morning right up until she died last June. Dudley was not happy when I brought home this interloper, but after about an hour warily sniffing each other’s behind they declared a truce. Zoe apparently told Dudley he was the alpha dog and then climbed onto my bed where she slept most of the time. Zo-Zo did know how to use her charms to get her way. Even though she was slightly smaller than Dudley, she was more muscular and took Dudley down the few times they tangled. Well, maybe not always a lady. Zoe had a vertical leap Michael Jordan would envy. She could jump a 6′ fence from a standstill; granted, she grabbed the top of the fence and pulled herself over, but she did it in the blink of an eye. When she had a running start, I don’t think her feet touched the fence as she sailed over it, it really was a sight to behold! It was also a total pain in the tuchus to keep her in the fence for 6-7 years before arthritis sapped her of this ability. Zoe embodied exuberance and abandon and loved each day more than the previous. I’ve never seen anything just enjoy “being” the way Zoe did. Even though I know I’ll never reach that level of optimism in this lifetime, it’s nice to have aspirations. As I think about this first year without Zoe, it is always that last verse of the Little Feat classic that comes to mind: “It’s been a year since she ran away — guess that guitar player sure could play . . . ” With her love of freedom and athletic prowess, I think the Z-Queen would approve. 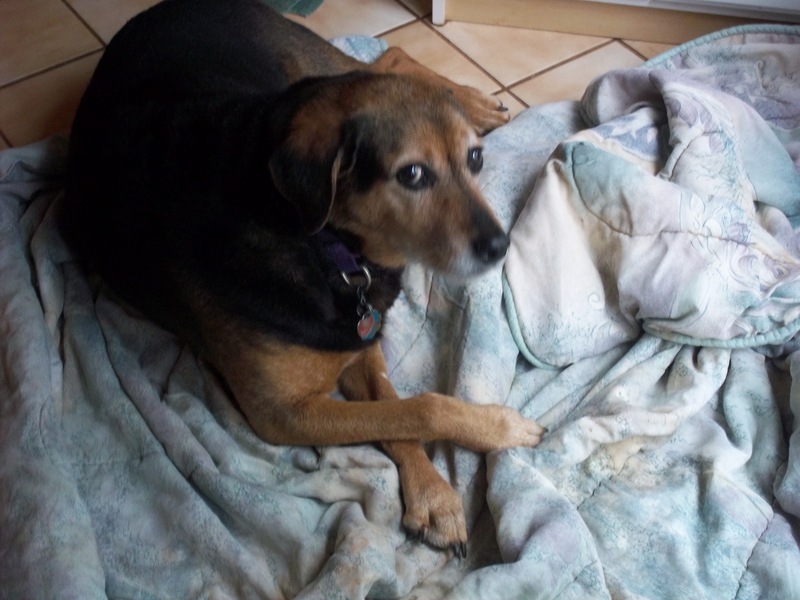 This entry was posted in Uncategorized and tagged black & tan hound, canine, dogs, Little Feat. Bookmark the permalink.